A horror legend returns this April when writer/director Dan Allen awakens the dead in The Mummy Reborn. 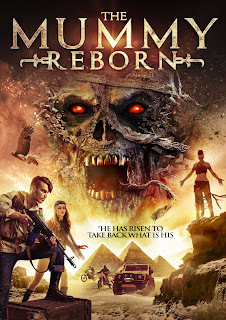 Written by Dan Allen and Scott Jeffrey, The Mummy Reborn tells of a group of teens in financial ruin that decide to rob the local antique store of an ancient amulet. But what they don't realise is that this tomb is cursed, and when the amulet is separated from it's master he will do anything to get it back. Our burglars must save the day and return the Mummy to it's tomb before it is too late to save the world. Becca Hirani (The House on Elm Lake), Tara MacGowran (Mandy the Doll), and Rita Siddiqui (Pet Graveyard) star in a Proportion Productions release. Packed with adventure and coffined with scares, The Mummy Reborn will be available on VOD and DVD April 4 from High Octane Pictures.